Our next headlining show in our hometown of Durham, NC is on October 14th at Motorco Music Hall. GarDel will be sharing the stage with one of the Southeast’s most established indie/progressive salsa bands, Bio Ritmo. Based out of Richmond, VA, Bio Ritmo has been going strong for twenty years, honoring the salsa dura tradition while adding their own spin to the music. 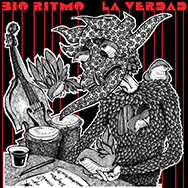 The two bands have been trying to connect since April, and this fall has been the perfect opportunity because Bio Ritmo is on tour in support of their latest LP, La Verdad. There are only eight tracks on La Verdad but within those tracks are packed more quality salsa grooves and innovations than many bands will ever accrue in their careers. Most importantly, it also manages to be an album that can be enjoyed via headphones or with your feet on the dancefloor, and this is something that many dance-orientated Latin albums miss, too often are they slaves to the rhythm. Give me La Verdadany day of the week. Exciting, yeah? Now that we are a few years into our own journey writing original salsa music, we know how important it is that others continue to push the genre forward. Please support live, local (& regional!) salsa bands. You can stream and purchase the album at descarga.com, or better yet, come out to our show at Motorco and buy it from the band in person! See you in October.